LEGAL STATEMENT This legal statement contains the terms and conditions governing this Site, http://aacpa.net, Don Carr dba aacpa.net. By using any of this Site, you expressly accept and agree to abide by all the terms and conditions contained in this Legal Statement. Do not use any Sites if you do not accept and agree to these terms and conditions. The Site is available only for your personal use, which shall be limited to viewing the Site, providing information to the Site, downloading product information for your personal review, and the purchase of products. OWNERSHIP Don Carr dba aacpa.net owns the entire Site, and is the seller of all merchandise purchased through this site. Don Carr, owns or has rights to all of the wallpaper, icons, characters, artwork, images, graphics, photos, music, text, software and other content of the Sites (the "Content"), and all HTML, CGI and other code and scripts in any format used to implement the Sites (the "Code"). The Content and Code of the Sites are protected by copyright. Except as set forth above, you may not copy, modify, upload, download, transmit, re-publish, display for redistribution to third parties for commercial purposes, or otherwise distribute any Code or Content from the Sites without the prior written agreement of Don Carr. You may not use the Content or Code from the Sites for any purpose other than those set forth above. All names, logos and trademarks which appear on the Sites are the property of aacpa.net, or are used by Don Carr or aacpa.net under license. You may not use any of the foregoing for any purpose without the prior express written permission of Don Carr. Your failure to comply with this Legal Statement will constitute breach of contract and will violate aacpa.net, Don Carr's, copyright, trademark and other proprietary and intellectual property rights. NO LICENSE Except as expressly provided above, nothing contained herein shall be construed as conferring by implication, estoppels or otherwise any license or right under any patent, trademark, copyright or other proprietary or industrial right of aacpa.net, Don Carr, Alamo Area Crime Prevention Association, AACPA, its affiliates or any third party. USE OF INFORMATION SUBMITTED BY YOU If you respond to Alamo Area Crime Prevention Association, AACPA, aacpa.net, or Don Carr with any information, including but not limited to feedback, data, questions, comments, suggestions, or the like, such information shall not be deemed confidential. All such submissions shall be deemed the property of Alamo Area Crime Prevention Association, AACPA, or Don Carr and your submission of information shall constitute an assignment to aacpa.net, AACPA, Don Carr of all worldwide rights, titles and interests in such information. Alamo Area Crime Prevention Association, AACPA, aacpa.net, Don Carr will not be liable for any use or disclosure of such information. AACPA will not have any obligation to keep such information confidential and will be free to reproduce, use, disclose and distribute the information to others without limitation. Don Carr, Alamo Area Crime Prevention Association, AACPA will be free to use any ideas, concepts, know-how or techniques contained in such information for any purpose whatsoever, including but not limited to developing, manufacturing and marketing products which incorporate or otherwise rely upon such information. Don Carr, aacpa.net, Alamo Area Crime Prevention Association, AACPA welcomes your comments and suggestions on its Site and products, but aacpa.net does not seek to solicit any confidential or proprietary ideas, suggestions, materials or other information relating to developing, designing, redesigning, modifying, manufacturing or marketing its products or any new products. By submitting information, you warrant that aacpa.net, AACPA, Don Carr may publish such information, use it as part of its operations, and incorporate its concepts in aacpa.net, AACPA's or Don Carr's products without liability. PRODUCT AND PRICING INFORMATION Products displayed may be out-of-stock or discontinued, and prices are subject to change. Alamo Area Crime Prevention Association, AACPA, aacpa.net, Don Carr is not responsible for typographical errors regarding price or any other matter. Subject to the foregoing, the prices displayed are quoted in U.S. dollars and are effective only for United States purchases. Purchases are subject to applicable taxes to be paid by the purchaser, and do not include shipping and handling. Purchase requests to addresses outside the United States cannot be filled. DISCLAIMERS Alamo Area Crime Prevention Association, AACPA, aacpa.net and Don Carr publishes information on its Sites as a convenience to its visitors. While Alamo Area Crime Prevention Association, AACPA, aacpa.net or Don Carr attempts to provide accurate and timely information, there may be inadvertent technical or factual inaccuracies and typographical errors. We reserve the right to make corrections and changes to the Site at any time without notice. Alamo Area Crime Prevention Association, AACPA, aacpa.net or Don Carr does not claim that the information in the Site is appropriate to your jurisdiction or that the products described in its Site will be available for purchase in all jurisdictions. Alamo Area Crime Prevention Association, AACPA, aacpa.net and Don Carr operates its Sites from the United States. It is possible that some software that may be downloaded from their Sites is subject to government export control or other restrictions. By visiting and using our Site, you acknowledge these restrictions and agree that you are not subject to them. Alamo Area Crime Prevention Association, AACPA, aacpa.net and Don Carr makes no warranties of any kind regarding any non-aacpa.net, AACPA, aacpa.net or Don Carr sites to which the user may be directed or hyperlinked from these Sites. Hyperlinks are included solely for the convenience of the user, and Alamo Area Crime Prevention Association, AACPA, aacpa.net and Don Carr makes no representations or warranties with regard to the accuracy, availability, suitability, or safety of information provided in such sites. Visitors assume all responsibility and risk with respect to their use of the Sites. Alamo Area Crime Prevention Association, AACPA, aacpa.net and Don Carr disclaims all warranties, representations and endorsements, express or implied, with regard to information accessed from or via the Site, including but not limited to all express and implied warranties, such as warranty of title, merchantability, non-infringement and fitness for a particular purpose. 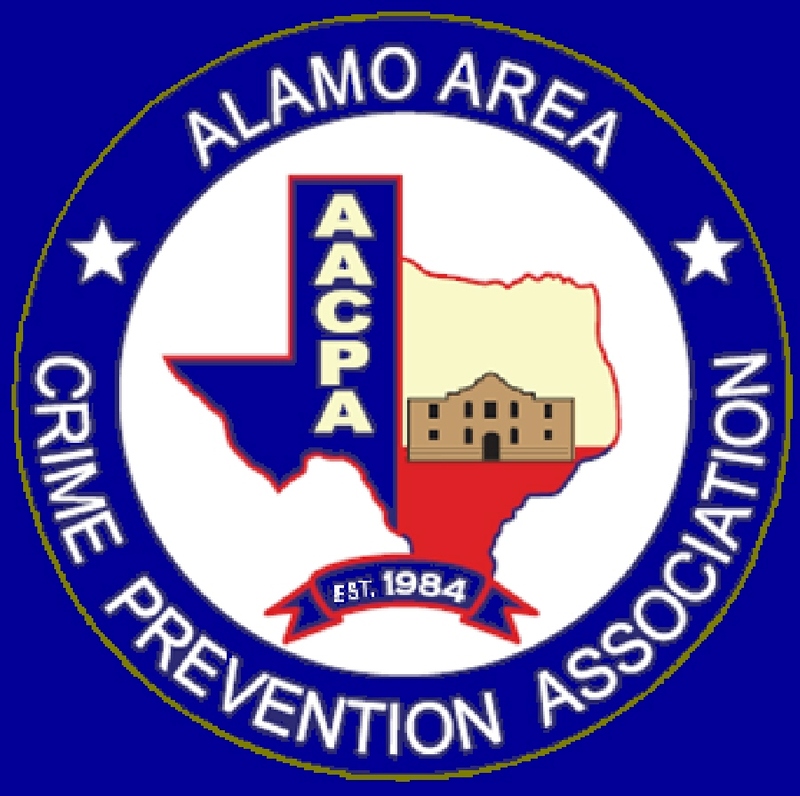 Alamo Area Crime Prevention Association, AACPA, aacpa.net or Don Carr does not warrant that the Site is free of computer viruses, bugs or other harmful components. Alamo Area Crime Prevention Association, AACPA, aacpa.net or Don Carr does not warrant that the functions contained in the material will be uninterrupted or error-free or that errors will be detected or corrected. Alamo Area Crime Prevention Association, AACPA, aacpa.net or Don Carr does not assume any liability or responsibility for the accuracy, completeness, reliability or usefulness of the information disclosed or accessed through the Sites. Alamo Area Crime Prevention Association, AACPA, aacpa.net, or Don Carr does not have any duty to update its Site or modify the Content or Code, and Alamo Area Crime Prevention Association, AACPA, aacpa.net or Don Carr shall not be liable for its failure to update such information. It is your responsibility to verify any information contained in the Site before relying upon it. IN NO EVENT SHALL ALAMO AREA CRIME PREVENTION ASSOCIATION, AACPA, aacpa.net OR DON CARR BE LIABLE FOR ANY DIRECT, SPECIAL, INDIRECT, OR CONSEQUENTIAL DAMAGES, OR ANY OTHER DAMAGES OF WHATEVER KIND RESULTING FROM WHATEVER CAUSE, INCLUDING BUT NOT LIMITED TO LOSS OF USE, LOSS OF PROFITS, LOSS OF DATA, OR ANY OTHER TYPE OF DAMAGE, TANGIBLE OR INTANGIBLE IN NATURE, WHETHER IN AN ACTION UNDER THEORIES OF CONTRACT, TORT OR OTHERWISE, ARISING OUT OF OR IN ANY WAY RELATING TO THE USE OR PERFORMANCE OF THE INFORMATION ON, OR ACCESSED THROUGH, ALAMO AREA CRIME PREVENTION ASSOCIATION, AACPA, aacpa.net, A DON CARR SITE. Alamo Area Crime Prevention Association, AACPA, aacpa.net, and Don Carr reserves the right to withdraw access to the Sites or to revise the services and products described in the Sites at any time without notice. Alamo Area Crime Prevention Association, AACPA, aacpa.net or Don Carr may at any time revise the terms and conditions contained in this Legal Statement by updating this posting. You are bound by any revisions and should periodically visit this page to review the current terms and conditions which apply to your use of the Sites. The invalidity of any term, condition or provision of this Legal Statement shall not affect the enforceability of those portions of the Legal Statement deemed enforceable by applicable courts of law.